One year Standard Search subscription. More than 3000 Days indexed. 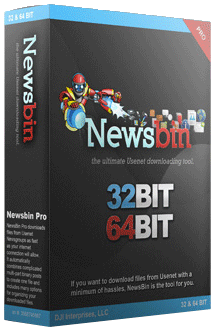 Includes a Free Key for Newsbin Pro. Automatic processing of RAR/PAR sets. Available in either 32 or 64 Bit Versions. License is good for up to 3 machines. Full NZB file processing support. Built in file download Scheduler. Newsbin Key without Usenet Search is available for $20.